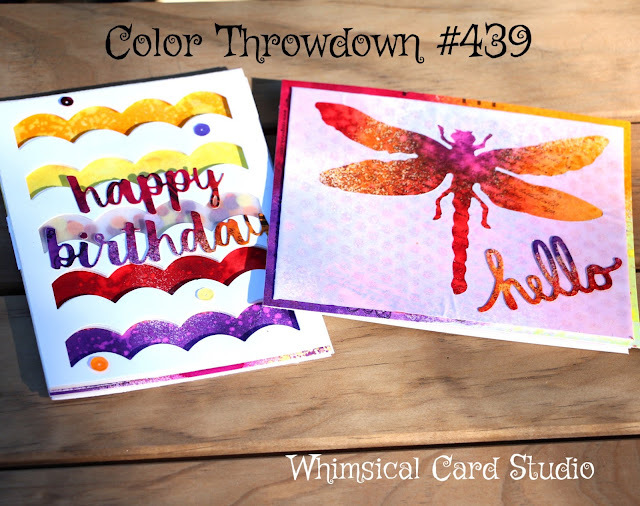 Today I am playing along with the Color Throwdown Challenge with a fun color scheme of red, orange, yellow and purple. I'll admit that the likelihood I would have chosen these on my own is low, which is why challenges are so fun to do! Another new thing to me is Dylusions spray inks. Although they have been around for years, for some reason I didn't try them out. All that has changed now ha ha!! I started with a piece of Strathmore 400 series watercolor paper in the 5.5" x 8.5" sheets, cut in half to make two 4.25" x 5.5" panels. 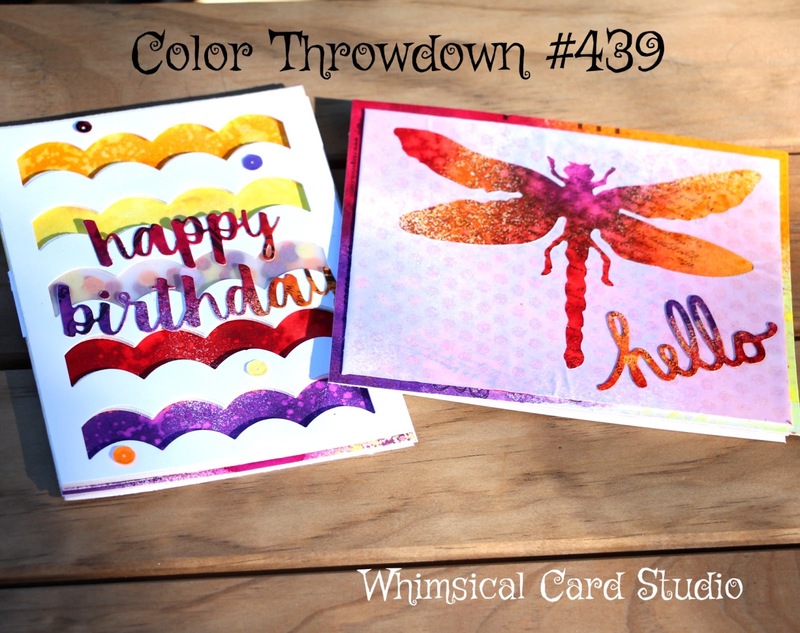 I sprayed the one for the card above in roughly 1" strips (two colors at the top and two at the bottom) and dried one color with a heat tool before masking and spraying another stripe. I left an uncolored area in the center. After this, I sprayed some water with the Ranger spray bottle lightly over the color, waited 15 seconds or so, then blotted the top with a paper towel to pick up the water, leaving a more textured look since the inks react with water. I die cut a white panel for the top as well as a thin craft foam piece from Queen & Company's waves cover panel die to create room for the mini-shaker section I created later in the center. I glued down the foam over the watercolor panel with Tombow multi glue. Next I added yellow, orange, purple and red sequins to just the center cut out area. I used a small piece of vellum to cover the shaker area, then glued on the top white panel to finish the panel. I added a few sequins on top to finish it off. One thing I would do differently if I make this again (or you re-create it) is to make the base color panel larger so more of it shows around the edges. For the second card, the Dylusions inks were sprayed on in random places onto the watercolor paper, then I dried with the heat tool, sprayed on a little water, waited a few seconds, and again blotted with a paper towel. For the vellum overlay, I first used a rubber stamp with a multi-dot pattern to stamp versa mark ink, then added Ranger glitter embossing powder and heat set. I die cut the dragonfly from the center of the vellum panel, then used the negative. I used spray adhesive on the back since I wanted it pressed flat against the colored panel and with all that color behind plus the embossing, I could not detect any show through from the adhesive. Instead of trimming the vellum I wrapped it around the edges of the panel so that it would not have a chance of lifting up off the colored panel. I try to be conscientious about not wasting paper and re-use scraps, and today I took it further by using the cardboard packaging from the Dylusions inks as part of my design. Yesterday was Earth Day and I support causes that are for conservation. Anyhoo - I practiced spraying on the back side of the packaging, which ended up creating my base layer under this card as well as the second one. 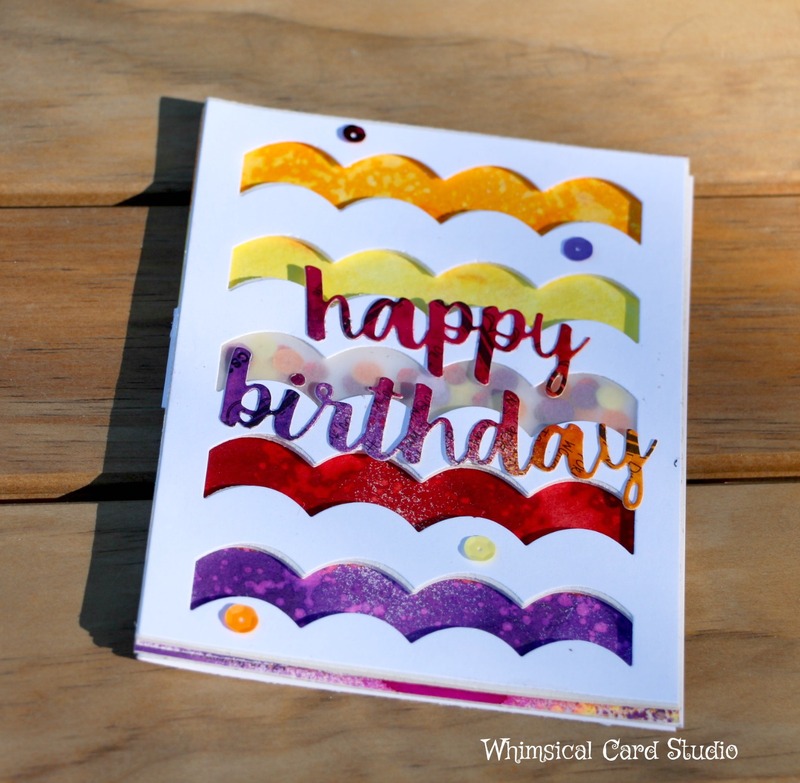 Before using it as the base layer, however, I die cut the sentiments "hello" and "happy birthday" from my practice panels, which coordinated perfectly with the color scheme and being cardboard, added nice dimension. Once the panels are glued to your card base, it's not noticeable that packaging was used. I think I would have made Lindsay, The frugal crafter proud :) - I have learned a lot from that lady. If you don't know who she is, leave me a comment and I'll share her social media links. 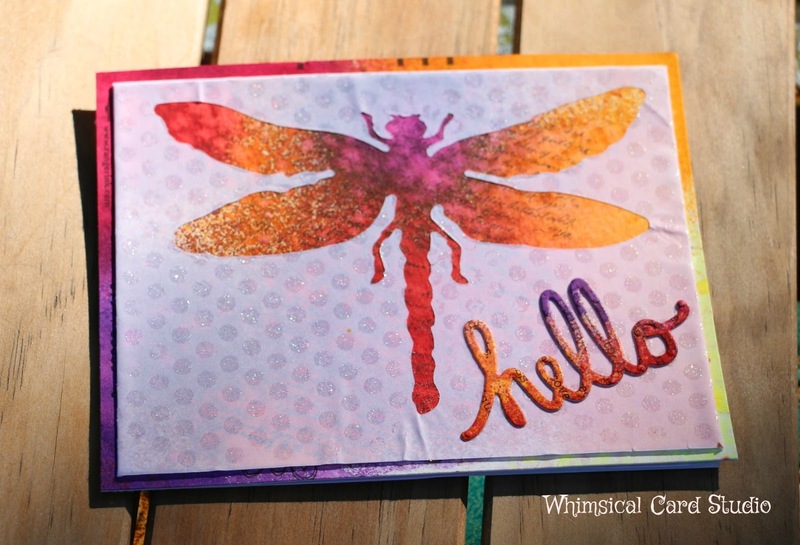 To finish the card, I glued it to a white 110# card base and glued the sentiment at a 45 degree angle to the dragonfly. Thanks for stopping by today. I've left some of the links below if you want to try out any of these products. These are not affiliate links and I only use these products because I like them personally and recommend. Fun cards! Love the multi-colored butterfly and the colors peeking out of the die on the first! So happy you joined us at CTD! Hi Sarah - they are more fun than I expected. I expect I will use them quite a bit now.